So…You Think You Can Be a Voice Actor? If people have been telling you that you have an interesting and distinctive voice, you may have wondered what it would be like to become a voice actor. Voice acting can be a rewarding and lucrative profession if you are willing to work hard and develop your natural talents. You may find opportunities to do voice over work for commercials or provide narration. You can also speak for characters in video games or act as a character in an animated movie or TV series. Voice actors sometimes even find jobs providing audio responses for help prompts in voicemail systems, informational kiosks and talking dolls for children. Even though you don’t appear on camera, voice acting is still acting, so don’t get into this line of work if you don’t want to be an explore that side of your abilities. In fact, at some voice acting jobs, animators will record video of each voice actor so they can study their facial expressions and body posture as they animate the character. Images of your performance may very well wind up being recorded after all, either for private use during production or even in the extra features section of a DVD or Blu-ray disc. Fans of a movie might get a big kick out of seeing the person who provided the voice for a cherished cartoon character. Training is essential for anyone who wants to break into the voice acting business. You need to work with professionals who have a proven track record who can listen to you and help you learn how to use your properly use your voice. Typically you will want to start by using your normal speaking voice, and as you become accustomed to modulating your voice in response to the demands of your director, you can start branching out by working with different accents and adopting different character voices, such as an older or younger version of yourself. You will need to have some reference materials on hand to study. Begin by going to your local library to look for books about acting in general as well as books specifically geared toward voice actors. If your library doesn’t have sufficient material, consult local bookstores and look for books sold online to build up your reference shelf. Sign up for local acting classes and try to find a teacher or mentor who has time to train you privately to develop your voice acting skills. Get together with fellow students and consider forming a group where you practice voice acting and record scenes together. As with any endeavor, the amount of success you can achieve in the field of voice acting is related to how much and how often you practice. If you have other demands on your time, such as work, school or family obligations, you need to make certain that you have carved out sufficient time every day to practice your craft. This might entail you putting off social engagements or indulging in entertainment so you can improve your voice acting skills. Start by informing the people in your life about your new project and how you might not be as available as you used to be. Mark out time in your calendar, such as an hour in the morning before you go to work or an hour at night when your kids are finally asleep. The time you put in now toward practicing the art of voice acting may lead to you getting jobs you can only dream of today. 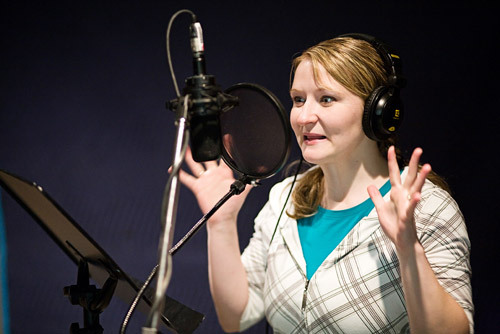 Voice actors are sometimes able to do their recording work in home studios, after which they transmit the recording over the Internet to their clients. Being able to set your own hours as a voice actor may be just the incentive you need to remember to practice every day.